У некоторых варлоков возникают затруднения в понимании, как работает данная лега. Ответ прост - неправильная локализация. В русском варианте написано Жатва Душ, в то время как способность артефакта называется Урожай Душ, а Жатва Душ - талант в тире с семечкой. Данная легендарка улучшает способность артефакта, т.е. 1 каждая израсходованная душа дает баф не на 5 секунд, а на 6.5 секунд. Basically, you get all your trait effects doubled for 50% longer. Seems incredibly strong, and as an added bonus, it doesn't look superficially OP so the whiners won't start screaming about it. I'd be MORE than happy to wear this, even with the poor stat allocation. After all, it's still got int. The cloak makes Жнец Мертвого Ветра last 6.5 seconds per soul (Current max you can reap is 12 stacks). At 12 it will make Жнец Мертвого Ветра last 78 seconds (Or 1 minute 18 seconds). 7.2. update: The max buff is 60 seconds, making you get max stacks at ~9 souls instead of 12. Going over 9 souls is most likely not going to give you more buff or benefit you. Looks like blizzard forgot to mention few details about the change related to this cloak. It still goes over one minute in 7.2.0 - unlike previously mentioned "at max 60 seconds". Remember, that in 7.2. you will have 0 souls at start of RAID bosses. But will "get 3 fast at start". So with cloak, at start of fight you will have 19.5 second buff instead of 15 seconds. This will make Нестабильное колдовство usage much more 'easier' and better. Since the general idea is to use 2 UAs, reap soul and then Похищение души for Гибельная хватка you should get full benefit from Drain soul's grasp since the channel lasts 6 seconds and this cloak makes souls 6.5s. You dont have to wait for 2 stacks of reap soul, tho 2 stacks still is probably better but "not so punishing" to reap 1 soul. But take this info with pinch of salt. I just got the 940 one to drop from the Dreamweavers emissary cache. 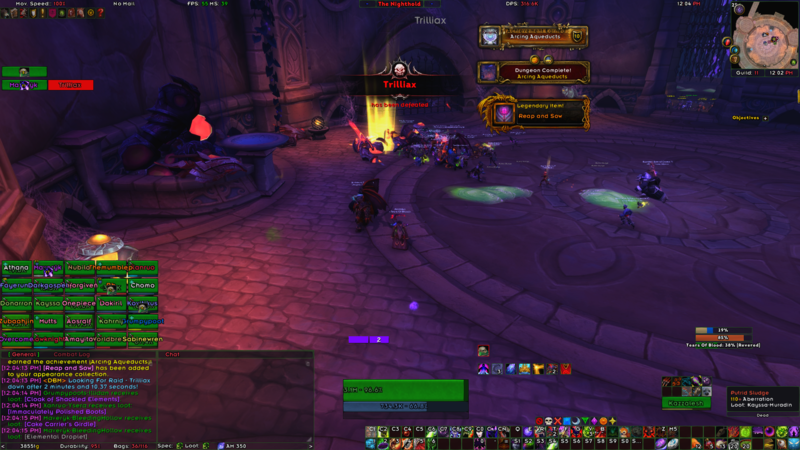 Mine dropped ilvl 1,000 from Trilliax, though I can't see anywhere that it claims he drops it. I assume there must be some global drop rate for legendaries. With the BFA pre-patch removing Reap Souls, the effect of this cloak has been changed to give you a flat 3% damage bonus for all abilities. Если на персонаже: "Урожай душ" действует на 1.5 сек. дольше за каждую поглощенную душу. "Что посеешь, то и пожнешь... Что ж, пора браться за дело."